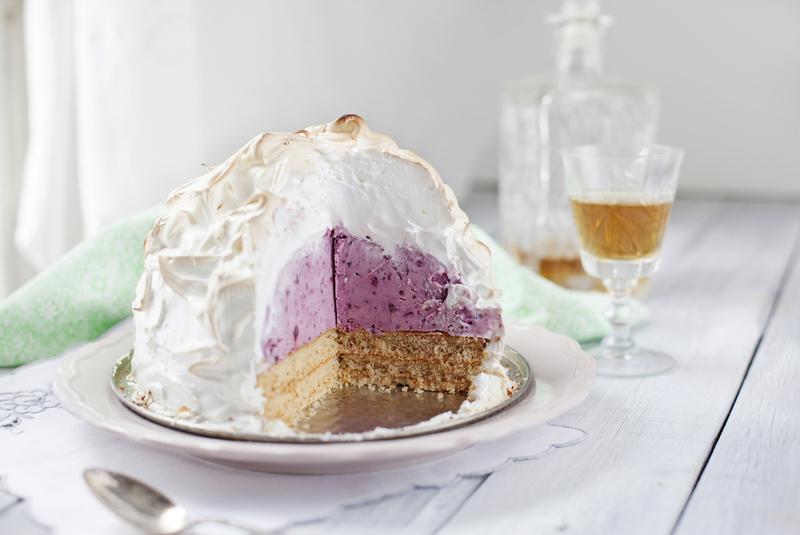 The lavish baked Alaska is made by placing ice cream in a pie dish or, for the classic dome shape, a bowl. Then, you cover the ice cream with slices of sponge cake to form the bottom of the dessert. Next, you flip the ice cream and sponge cake upside down and onto a flat dish and cover the ice cream with meringue (egg whites and sugar whipped to a stiff foam) as if you were frosting a cake. The entire dessert is put into a really hot oven long enough for the meringue to caramelize, but short enough to keep the ice cream from melting. A classic dome-shaped baked Alaska, with a layer of caramelized meringue around the ice cream. As the story goes, the name “baked Alaska” was coined in 1867 at Delmonico’s restaurant in New York City to celebrate the recent acquisition of Alaska from the Russian Empire. The true origin of the baked Alaska, however, has always been up for debate. The ice cream in the baked Alaska stays frozen, even when placed in a hot oven, by taking advantage of the insulating properties of the trapped air in the cellular structure of the foam components (the meringue and sponge cake). The ice cream is surrounded by meringue and sponge cake, which conduct heat very poorly. This keeps the intense heat in the oven from reaching the ice cream. All of these factors can be simulated using a COMSOL Multiphysics model of the baked Alaska. 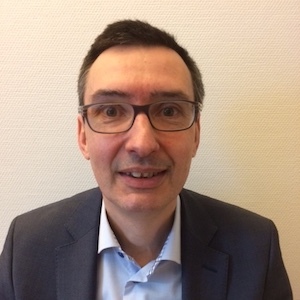 Such simulations can provide insight into the quantitative effect of each of the factors to ensure that the dessert turns out to be a success at the dinner table every time. For the geometry of our baked Alaska model, we use a half sphere for the dessert’s common dome shape. The geometry includes a layer of sponge cake at the bottom and a layer of meringue covering the dome-shaped ice cream. The thickness of the meringue layer is added as a parameter so that it will be easy to vary. The thickness is initially set to 2 cm. For the same reason, the oven temperature is also added as a parameter and is initially set to 250°C. Some recipes call for an oven temperature of around 220°C and a cooking time of about 8 to 10 minutes, whereas other recipes use a higher temperature of around 250°C and just a couple of minutes in the oven. Our simulations will show whether the dessert comes out as expected in both cases. 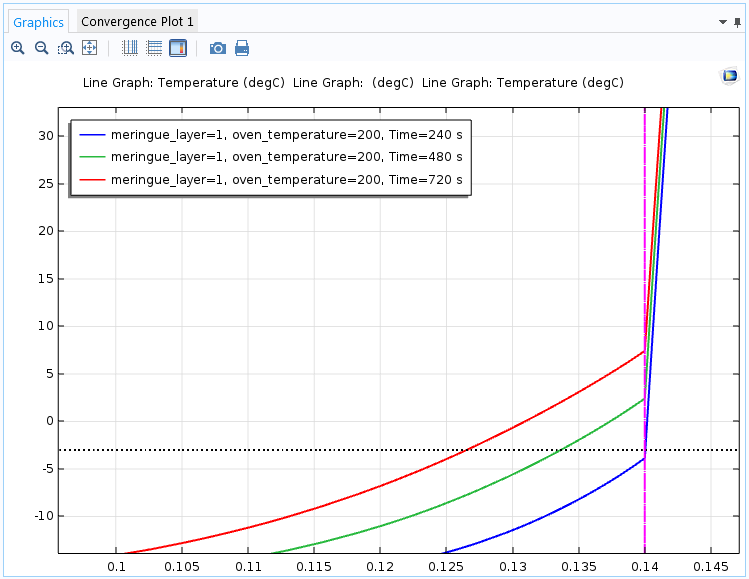 We set up a time-dependent heat transfer simulation using the Heat Transfer in Solids interface in COMSOL Multiphysics. As input to the simulation, we need to provide the density, thermal conductivity, and heat capacity for the ice cream, meringue, and sponge cake. The values used in this simulation come from the book The Kitchen as Laboratory: Reflections on the Science of Food and Cooking, edited by Vega et al. The material properties are added to three Material nodes, which are assigned to the domains in the geometry that represent the ice cream, meringue, and sponge cake, respectively. From the data, the meringue and the sponge cake are equally poor thermal conductors, which means they both provide ample thermal insulation covering the ice cream. For modeling heat transfer, the Heat Transfer in Solids interface uses the material properties from the respective materials. The initial temperatures are set to -18°C for the ice cream (a typical freezer temperature), 8°C for the meringue (typical if using eggs that have been stored in a refrigerator), and 20°C (room temperature) for the sponge cake. For the boundary conditions, a heat flux with a large heat transfer coefficient represents the convective heat flux in the oven affecting the temperature of the baked Alaska. We can set up a time-dependent study to simulate the temperature in the baked Alaska from the moment it is put in the oven to the point where it has stayed there for 12 minutes, which is a bit beyond what would be required according to most recipes. 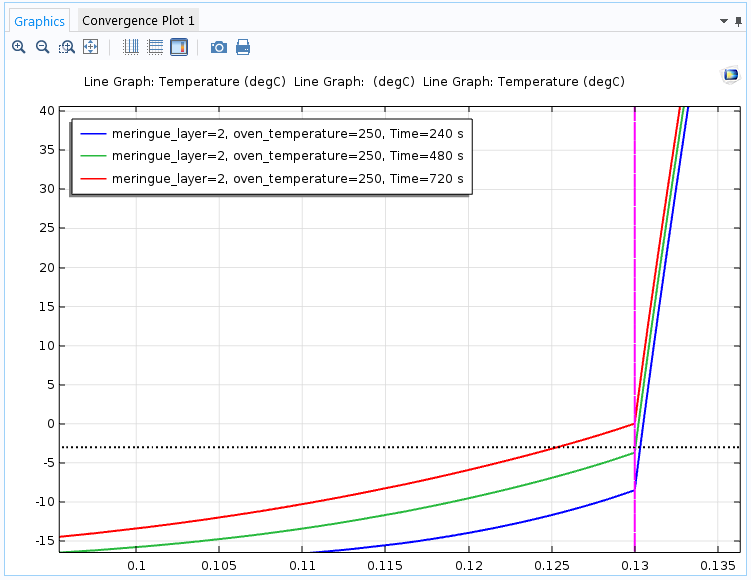 In addition, a full parametric sweep is added to analyze the effects of varying the meringue layer and the oven temperature. 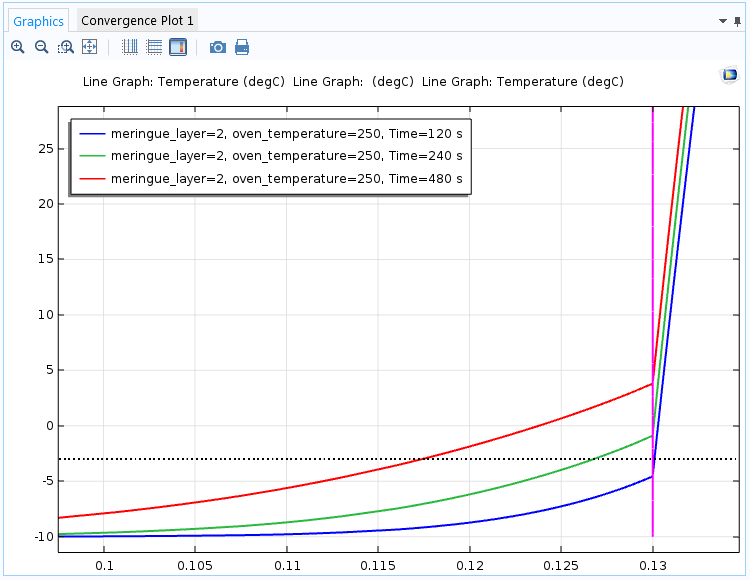 The following image shows how you can choose to plot the temperature distribution from any combination of those two parameters and the time. Selecting values for the thickness of the meringue layer, oven temperature, and time for a fully parametric time-dependent simulation. As the primary result from the simulation, the temperature in the entire baked Alaska can be displayed as a volume plot, as shown below. The temperature field (in degrees Celsius) inside the baked Alaska after 4 minutes with a meringue layer of 2 cm and an oven temperature of 250°C. Next, we perform a more quantitative analysis using a cross-sectional temperature profile. As an extension of this model, we also show an example of how to vary one of the initial temperatures to analyze what happens if the ice cream has been left to thaw for a while before putting the baked Alaska in the oven. Will the Ice Cream in the Baked Alaska Melt? A criteria for keeping the ice cream frozen is that the temperature stays at -3°C or lower, even where the ice cream is close to the meringue or sponge cake. The following plot shows the temperature at the center of the baked Alaska with a meringue layer of 1 cm and an oven temperature of 200°C from the bottom to the top after 4, 8, and 12 minutes. 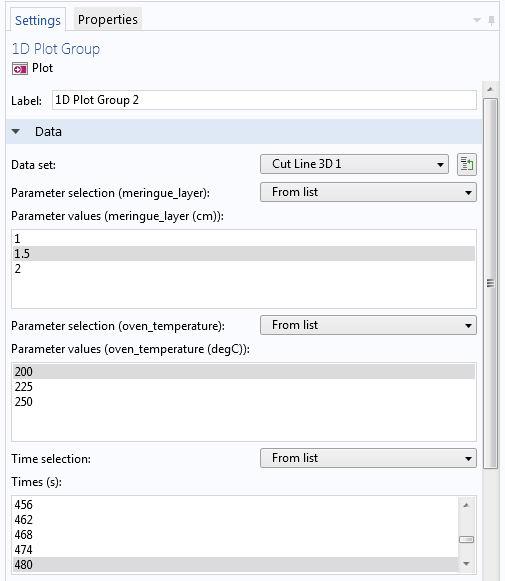 The following plots use a Cut Line 3D data set to evaluate the temperature along the centerline from the bottom to the top. 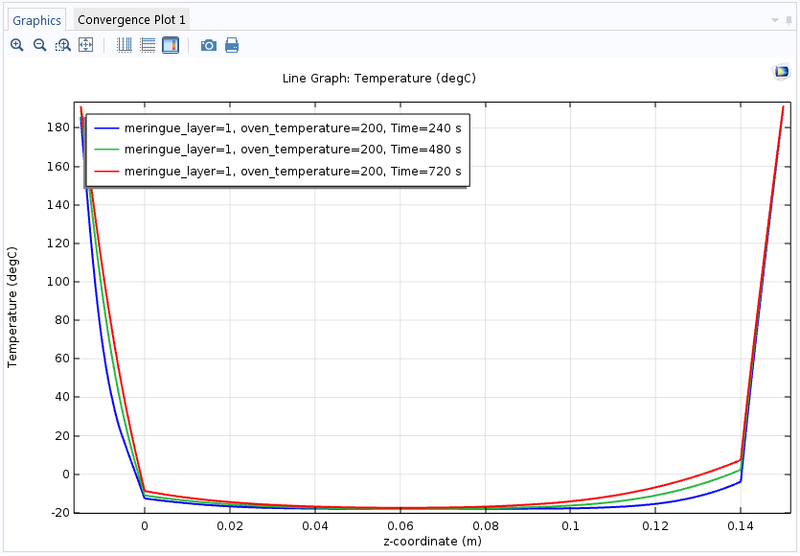 The temperature is plotted using a line graph in a 1D Plot Group. The temperature profiles from the bottom to the top of the baked Alaska after four minutes (blue), eight minutes (green), and twelve minutes (red). In the close-up plot below, additional straight lines represent the ice cream melting point and the meringue-ice cream border. These lines are created using extra Line Plot nodes in the same plot group and two parameters that define the levels. The temperature toward the top of the baked Alaska after four minutes (blue), eight minutes (green), and twelve minutes (red). The ice cream melting point is the dotted black line and the vertical magenta line indicates the meringue-ice cream border. After eight minutes, the outer part of the ice cream starts to melt. The simulation shows that the ice cream is intact after 4 minutes, but after 8 minutes, the 1-cm meringue layer is too thin to prevent the ice cream from melting from the outside. If we were to switch to a 2-cm layer, the baked Alaska could remain in the oven for a full 12 minutes, if necessary. Let’s switch to another parametric solution to see what happens if we increase the meringue layer to 2 cm and the temperature to 250°C. The following plot shows the simulation results toward the top of the baked Alaska. The temperature toward the top of the baked Alaska after four minutes (blue), eight minutes (green), and twelve minutes (red). After eight minutes, the outer part of the ice cream is still frozen despite the hotter oven, thanks to the thick layer of meringue. The simulation shows that the ice cream hasn’t melted, even after 8 minutes, thanks to the thicker layer of meringue that insulates the ice cream from the high heat. 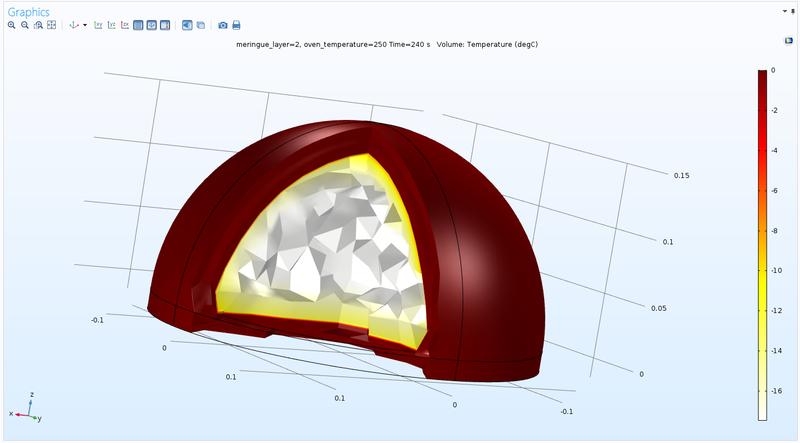 A temperature of 250°C and an oven time of 4 to 5 minutes are values that you find in several recipes for the baked Alaska, and our COMSOL Multiphysics simulation confirms that the ice cream should remain intact with those oven times and temperatures with a 2-cm meringue layer. Let’s consider a case where the ice cream has been taken out of the freezer for some time, which some bakers may want to do to easier shape it into a dome. If we rerun the simulation for the case with a meringue layer of 2 cm and an oven temperature of 250°C, but with an initial ice cream temperature of -10°C instead of -18°C, then we get the following results. The temperature toward the top of the baked Alaska after two minutes (blue), four minutes (green), and eight minutes (red). After four minutes, the ice cream already starts melting. The higher temperature in the ice cream, as expected, makes it reach the melting point a lot quicker, so it is important to keep the ice cream as cold as possible. In this case, it already starts melting after about three minutes, so if you don’t handle the baked Alaska quickly, it might be slightly melted by the time it reaches the dinner table. To summarize, these simulations have shown that if you keep the meringue layer thick enough, the baking time reasonably short, and the ice cream cold, you should be able to make a dessert with a nicely caramelized meringue on the outside and delicious frozen ice cream on the inside. In turn, this classic dessert will continue to impress dinner guests by its apparent defiance of the laws of thermodynamics. Using COMSOL Multiphysics, we can show that the layers of thermally insulating meringue and sponge cake can prevent the intense heat of the oven from melting the ice cream, making for a perfect baked Alaska. Bon appétit!